Radar remains the single most important collision-avoidance device available to both leisure and commercial sea-going vessels, and now that a clutch of high-performance, instant-on solid-state radar systems have come onto the market, sailors can buy high-definition radar at a reasonable price. Out go the heavy, power-hungry magnetron pulse scanners, to be replaced by lightweight, low-power solid-state technology. Using sophisticated electronic filters and high-tech features such as beam sharpening and Doppler target speed recognition, the resolution and intelligence of these modern radars is astonishingly good. Older magnetron radars output a crude, high-power pulse and then wait for it to be partially returned before emitting a second pulse. This time delay leads to a blurred echo being pasted onto the screen, and sometimes no echo at all in rough sea conditions. Traditional radars also rely on a narrow bandwidth to “crisp up” target echoes, meaning bigger is better. Large open-array scanners can emit a narrower beam for more precise horizontal resolution, but these aren’t suitable for sailboats below 65ft. Modern Frequency Modulated Continuous Wave (FMCW) radar, called Broadband by the Navico brands that use it, transmits a continuous wave, but with a variable frequency, enabling the receiving electronics to identify the signal and discriminate easily between each return. This, along with greatly increased processing power, not only enables higher range resolution, especially at very close ranges but provides improved horizontal separation between more distant targets. 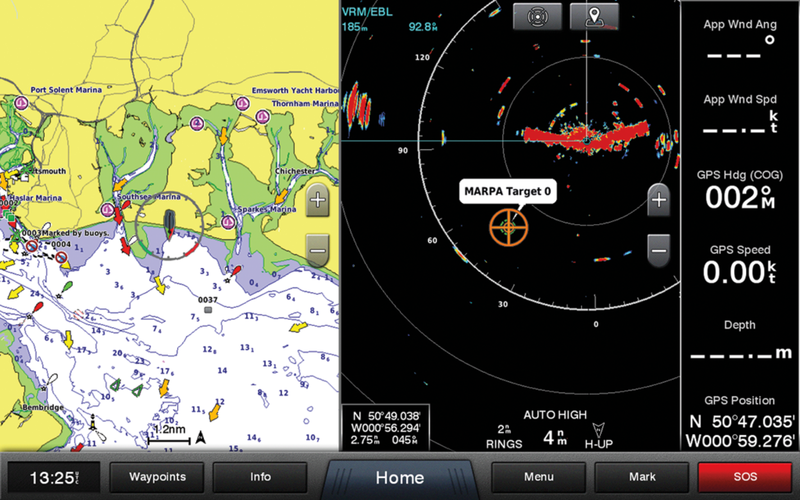 Raymarine, Garmin and Furuno have all recently adopted another solid-state radar technology called Pulse Compression. As with magnetron radar, the scanner transmits a pulse, but one that is frequency-modulated, enabling it to resolve the target more readily by analyzing the full array of returned signals simultaneously. FMCW radar can detect targets so close you can almost touch them, while compressed pulse radars have also reduced the noticeable “hole” in the image surrounding your vessel seen with magnetron radars. Solid-state radar further benefits owners of sailboats by having a much lower power draw and weighing less than a traditional scanner. Compatible with all NavNet TZtouch and TZtouch 2 MFDs, this is Furuno’s first solid-state, pulse compression radar, and it makes very good use of the Doppler Effect. Both Target Analyzer and Fast Target Tracking provide accurate and rapid vessel movement monitoring. The DRS4D-NXT is only available in a 24in radome, which though a little more awkward to install on a small to medium size sailing yacht, actually weighs less than the 18in B&G model and has a lower profile. 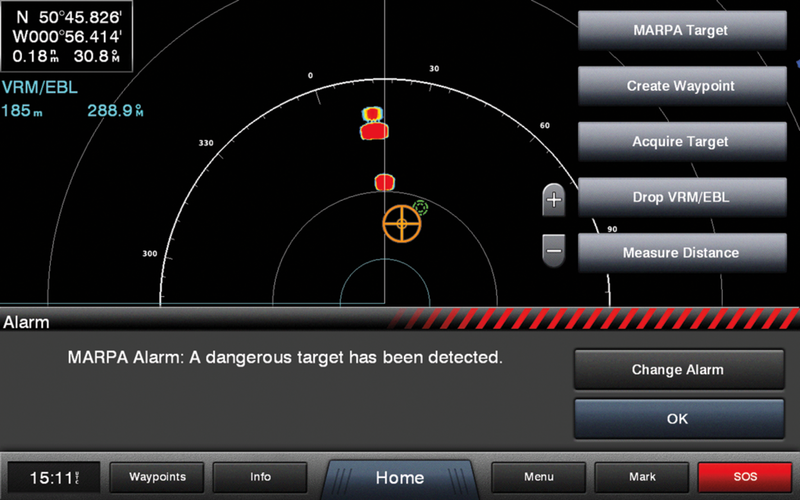 The Doppler-assisted Target Analyzer function is a quick and easy way to identify targets that might present an imminent risk of collision. Put simply, any vessel travelling toward your own is painted in red, while everything else is is shown in green. Another useful feature is RezBoost beam sharpening—which increases the image resolution by giving a horizontal beam width similar to that of an open array antenna. This greatly improves horizontal separation between smaller targets and helps with identification. We found the radar features of the Furuno easy to find, use and operate, although there are quite comprehensive adjustments possible in the deeper setup. If you are an expert and like to set all your own parameters, then this one’s for you. Otherwise, setting up the basics, such as heading alignment, guard zones and exclusion sectors is straightforward. In addition to the red Target Analyzer feature, the Doppler Effect is also used to significantly improve the radar’s ARPA tracking ability, and Furuno was already the sole manufacturer to offer ARPA to reacreational boaters. You can use the ARPA function manually by simply touching a particular target and selecting “Acquire” from the drop-down menu. This is one of the most important features of any radar and offers vital assistance with collision avoidance. Moving vessels can be selected manually within a set range. The radar then tracks the target’s position, speed and direction, giving you the CPA and TCPA and warning you if a collision is imminent. 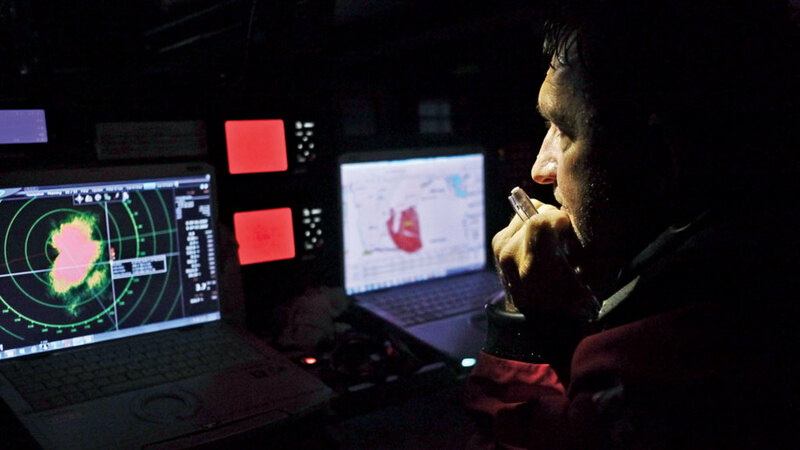 Like tracks on a chart plotter, some radars can also be set so that a moving vessel leaves a trail on the screen to help show you its recent direction of travel. Furuno NXT offers full ARPA, meaning that targets are selected and acquired automatically. MARPA and ARPA features require a heading sensor to be connected into the network, which is often an optional extra. It’s possible to set up one or more sectored guard zones ahead of your vessel, as well as an exclusion ring around it. In either case, an alarm will sound if any other vessel comes inside predetermined guard perimeters. 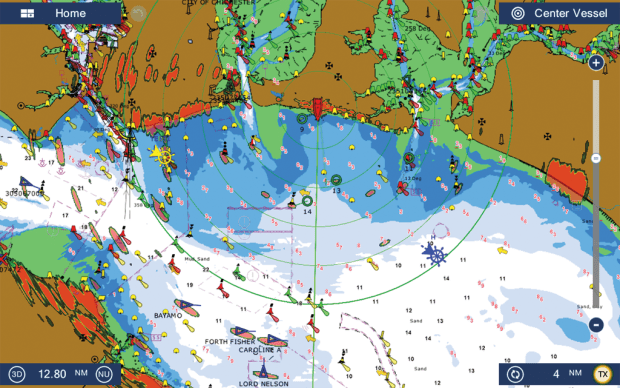 All modern MFDs now allow you to overlay a radar scan over your chart, which greatly clarifies the radar picture and helps you to easily and quickly differentiate between land, buoys and other moving vessels. All manufacturers prefer that the vessel has an accurate heading sensor to best synchronize chart and radar, but some will use GPS course over ground (COG) instead. In all cases, a plain radar window can be shown along side a chart window with radar overlay. 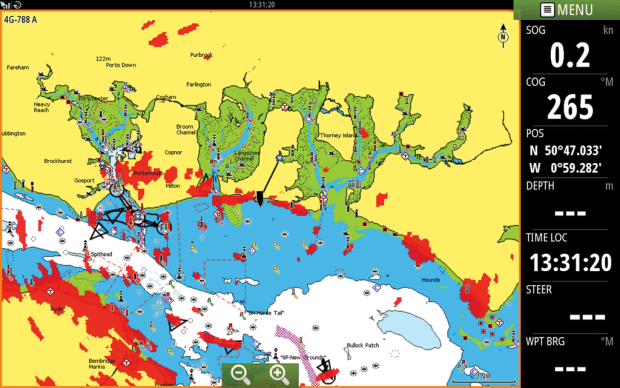 Navico pioneered solid-state marine radar in 2009, and B&G now offers 3G and 4G models. Both radomes feature Target Separation Control beam sharpening, which halves the effective horizontal beam width from 5.2 degrees to 2.6 degrees and raises its target discrimination abilities closer to that of a 4ft open-array antenna. The 4G has more transmit power, increasing maximum range from 24nm to 36nm, and extends 3G’s 24rpm/36rpm choices to 24rpm, 36rpm and 48rpm. 4G also offers completely independent dual ranges, and is the only radar that can overlay dual independent ranges over dual chart windows. While the 3/4G radomes use a single cable for power and data, the scanner connects via an RI10 junction box, which is then linked to the MFD via Ethernet. If you want MARPA you’ll also need to connect a SimNet-to-NMEA2000 converter cable between the RI10 and your NMEA-2000 network to provide heading data. The 3G and 4G radars will connect to any of B&G’s Zeus MFDs (and similar Simrad models can be used with their NSE/NSS MFDs). The screen is clear and well-defined, and offers direct on-screen access to the clutter filters, gain and range. There’s plenty of information panels available as well, including a comprehensive window showing current MARPA and AIS vessel data, guard zone setting and alarms, and VRM/EBL information. You can also choose whether to place a navigation instrument bar down the right-hand side as well. On the radar screen all the options are available on a drop-down Radar menu, including the settings for gain and filters, MARPA target acquisition, Target Boost control and more. The Doppler effect has been known and utilized for many years, but until now no manufacturer has managed to take advantage of it in an affordable recreational radar. Put simply, the radar is capable of distinguishing the relative motion of all targets on every sweep of the antenna. Thus Doppler target speed discrimination can paint all targets that are fixed, moored or moving away from you in green or amber while any vessel moving in your general direction is highlighted in red. This is exactly the feature that Furuno calls Target Analyzer on its DRS4D-NXT radome (see the previous page). Garmin has done the same, and its MotionScope can also usefully highlight vessels moving away from you, but currently its only solid-state Doppler radar is the Fantom 4ft open-array. Modern radars offer dual-, or triple-speed scan rates—usually 24rpm, 36rpm and 48rpm. These may be set manually or set to automatic when they adjust to suit the selected range. The faster speed, the faster refresh rate, which is useful when in close-proximity, although the trade-off is reduced long-range power. Some modern radars, including magnetron and solid-state, can show two radar ranges at once with completely independent controls for each. Raymarine’s recently launched, lightweight Quantum radar is its first leap into solid-state pulse compression radar, which it rightfully calls CHIRP. Quantum is the first radar whose data connection can be via either Ethernet or Wi-Fi. Using the latter means that the radome can be powered with almost any existing radar cable already in your mast, or even a spreader light cable, as long as the Quantum and a compatible MFD have a good Wi-Fi connection signal. The Quantum boasts Advanced Target Separation (ATX) technology, which appears to be beam sharpening and perhaps other signal processing techniques and seems to produce top quality imaging at both long and short range. The radar is designed to interact with the latest LightHouse II user interface, enabling easy access to this high-performance radar technology. It also boasts a very low power consumption, just 17W (1.4A at 12V) on transmit and 7W (0.6A at 12V) on standby. Raymarine’s latest eS-series MFDs have a superb, non-reflective sunlight-viewable display that greatly enhances the radar image. The iconography is also clear and the touchscreen responsive, even with cold hands. Setting up the windows and split screen is also a doddle. However, the LightHouse II operating system seems a little slow. Yes, many aspects are good and the iconography clear, but problems arise with menus that are too short to get all the function buttons in one list. Some of the filter functions are very good—especially the weather button, which adjusts the rain clutter filter to allow rain-bearing squalls to appear more clearly without having to manually play around with the filter controls. The range and rotation speeds are limited to 24nm and 24rpm respectively. Also, it lacks a dual-range split window option that the other radars mentioned here have. 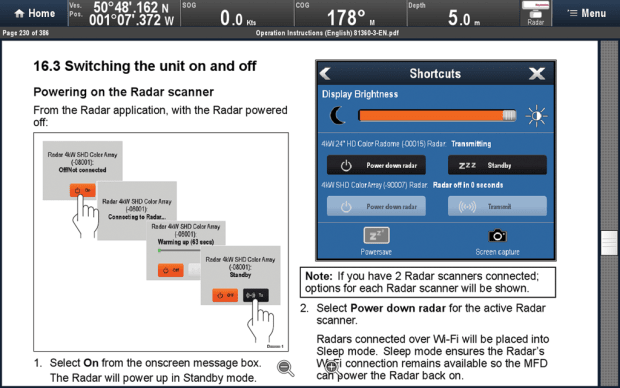 The Wi-Fi function might be useful for tough install situations or racing boats, where even the weight of the data cable up the mast might be detrimental to stability and speed, but for the cruising sailor I don’t feel it’s worth the risk of Wi-Fi interference disabling your radar when it’s most needed. No more lengthy wait for the radar to warm up, all the features of solid-state radar are ready to use almost the instant you power it up and press transmit. Navico’s FMCW radar achieves greatly increased range resolution of nearby objects, even down to 300ft, which is ideal for pilotage assistance in limited visibility as it allows the user to more easily identify channel markers and buoys. Pulse compression also has good range resolution and all solid-state provide horizontal resolution that’s comparable to bigger antennas. Magnetron radars often consume 120W+ when transmitting, which could only be fully mitigated by shutting them down, since warming the magnetron to Standby mode is also power-expensive. Solid-state radar uses far less power, around 25W max, making it well suited to sailboat installation. Lightweight solid-state radome scanners generally weigh around half that of a traditional magnetron model, so put less weight aloft. Reduced signal-to-noise ratios mean there is less interference on the display in poor weather conditions.